An easy way to make a room look more beautiful can be something as simple as a room screen divider added to your living or workspace. People make or purchase one, often for this very common reason. But this stylish statement piece is not the only reason why a person may acquire a divider. You may want to hide a mess or an unfinished area of your home, increase your homes privacy, divide up a room, reduce noise transfer or create a visual interest point in an open plan living space. There are many other reasons, as well. There are some basic things to keep in mind when looking for the perfect room screen divider. The first is deciding whether you want to purchase or make it. If it is the latter, you will have to find a form, pattern and material as well as find the style that you desire. All of this will need to be decided on based on where you will be using the screen. If it is to be an office divider screen, then you may want to choose contemporary and modern materials. If it is to tie into a themed room, you will want materials that complement your pre-existing design rather than fighting or clashing with it. If it is for a bedroom or living room, you may want to go with a more intricate design with elaborate detailing. If it is for a work space or one that will be moved around often, you will want to create or find one that has a strong durability so you won’t have to worry about it breaking on you. 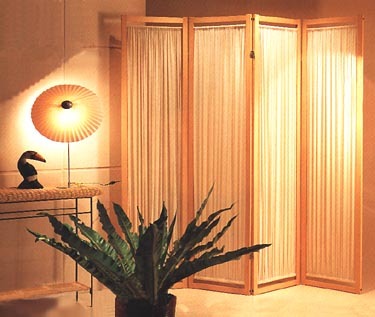 If you are wanting a screen purely for its aesthetics, or if it is to be used in a small space, you will want to choose a lightly-colored or sheer room divider screen that will not shrink the size of the room. After you have decided the where, why and what of your room screen divider, the next step would be in finding one.